Q. When you arrive in Los Angeles and a cranky Greek cabbie doesn’t want to give you a ride because even though you’ve just stepped off of an International flight, he still wants you to have a baby car seat, even though the hotel is just a few minutes down the road? Q. How many times has a drink vending machine eaten your money in Japan? Since you’ve come back to the US? A. That would be one and one, respectively. Q. How many times do you have to call the front desk to enquire about the baby crib that they said would be “no problem”? A. Four, going on five rather soon if they don’t call back soon. Q. When did hotels in the US stop supplying toothbrushes to guests? The time has come for me to go on my way. It was the experience of a lifetime, even with all of the stress that came with the office. I will continue writing on this blog, perhaps from a slightly different perspective, but always with a mind towards the Far East. The Economist and The Atlantic, my two favorite magazines–though one wishes to be called a newspaper–have published some very interesting articles on the housing crises in the US. I thought I’d share them for anyone interested. How the Crash Will Reshape America, by Richard Florida in the March 2009 issue of the Atlantic, describes how real estate and financials booms have created and leveled cities in North America since the Industrial Revolution. The article argues for the reincarnation of New York, even though it is the home to American finance and the current recession. The author argues that cities with one specialty are more likely to fail to make a come back after this recession, just like manufacturing towns in New England in the past. It is a long article that covers the effects of globalization, labor movement, and regional industries. It is an interesting read and I think it asks very important questions for all to think about, whether you live in the US or not. Most likely these issues may also plague other countries too. Japan is quite similar in this respect actually. Tying health care to a job can tie people to jobs they hate. Gerry Stover, who now runs a doctors’ group in West Virginia, recalls a time when his wife was pregnant and he couldn’t get health insurance at a private firm. He became a prison guard. As a public employee, his family was covered. But the job was neither pleasant nor a good use of his talents. Imagine if you had a severe illness, or perhaps your child has a chronic illness. If your current employer is the source of your health care plan, what happens if you voluntarily leave the employer for a better job with more pay or to improve your family’s future? The health care provider at the next employer may not cover the existing condition, or they may require outrageous premiums to cover the condition. I never really thought about this until now, having a baby opens your eyes to a lot of issues that you might not have thought about as a bachelor. Let’s talk about banking. Depending one where you hail from, you may disagree with my opinion, but I come from North America, land of rogue finance, and I frankly find consumer banking in Japan to be absolutely frustrating. I don’t mind not having personal cheques and I don’t mind having to use a chop (hanko) in place of a signature. But when are debit cards going to make it? The J-Debit network is not anywhere near as convenient as the Visa network, you can’t even compare the too. Also, all of the inconveniences the banks put between me and my money just makes me want to scream sometimes. With the 0.004% interest rates at the bank, sometiems I’ve wondered if I ought to just save my money in a jar instead of bank! Any way, below are my experiences with different banks in Japan. If you have any good recommendations for expatriates, I’d love to hear about them. Let’s get the information flowing so other expats don’t have to suffer. 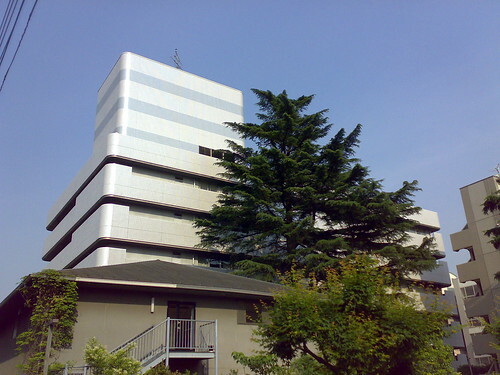 When I first arrived in Japan, I had to wait for my alien registration card to be made, but afterwards with the card in hand, my passport, my employee ID from work and a letter from the General Affairs group at my company confirming my employment, I sought to open a bank account as nearly all companies pay salary via direct deposit. I tried two of the major national banks, Mizuho Bank and Tokyo Mitsubishi UFJ (then just UFJ), but they turned me away and said they don’t consider foreigners for bank accounts until they have resided in Japan longer than six months. They advised me to try a smaller, more local bank for the time being. The local bank no doubt was happy to accept my money, and after a few months they even extended a small line of credit with a Visa credit card. Sure, the ATM was only available from 9 AM to 7 PM with no fees, but for my basic banking needs in Japan this was enough. The downside is that the bank card could not be used overseas, and they didn’t really want me sending money overseas either. I still had debts in the US to clear up, and each time I needed to make a payment I had to show up in person at the bank between 10 AM and 12 PM while the money markets were open, meaning I had to take time off from work. I hated that I had to use personal time just to transfer my own money overseas. My personal time should have been for travel and relaxation, not for going to the bank and waiting on queue for an hour! 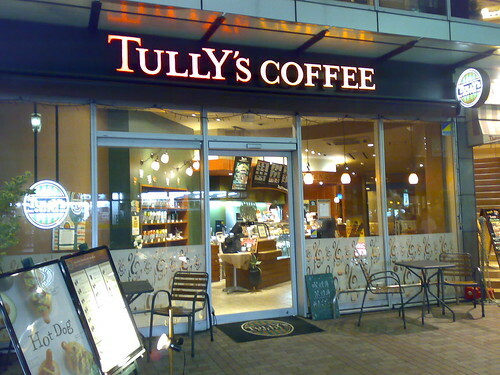 In addition, there was a 4,500 yen service charge along with a lot of anti-money laundering paperwork and long explanations of why my bank in North America had the world “Corporation” on the end of its name. The second largest bank in Japan, I had to create an account with them because an employer required. This bank was by far the worst that I’d ever dealt with in my life. Like the local bank, this bank had severely limited lobby hours, the ATM has various services charges based on time and day of the week, and it took over two hours just to create an account in the first place. In 2005 I believe UFJ and Tokyo Mitsubishi merged, and they created this mess of a banking system that still exists today. If you go to a branch office with a Burgundy circle on the window, it means it used to be a UFJ branch. Only former UFJ accounts can be serviced by this branch. If the branch office has a red diamond, it is a Tokyo Mitsubishi branch, and only such accounts can be serviced by the branch. Of course if you don’t know this then you end up making a trip to the bank for nothing–of course during the hours of 9 AM to 3 PM only. When I closed my account as soon as the job ended, they made a mistake and forgot to deduct the balance of my credit card from the account which they had not finishing processing yet. They gave me my cash, and I went on my way pissed off I had to go entirely out of my way to find a branch with a dumb red diamond in the window. Two weeks later they called me up and admitted the mistake they made, and asked if I could still pay the bill. Not wanting to destroy my hard-earned credit status in Japan, I told them I would be happy to pay the ~13,000 yen still on the card account balance. They then told me since I no longer have a savings account, I would have to go to the branch where I opened up the account, Toranomon near Shimbashi, and pay in cash. I could hardly hold back the laughter. I did the unthinkable and told them I would not take a day off to go all the way to Toranomon, but I would happily pay the balance using another credit card, a bank transfer from another account, or in person with cash at the Tokyo Mitsubishi UFJ branch near my home (which is actually a former UFJ branch). The bank clerk was appalled at the heinous demands of your author. She called me back twice, first consulting with her manager each time, and then trying to convince me to pay in Toranomon. I said I’d do it if they allowed me to come it on a Saturday–I was not budging on taking time off from work. Blasphemy! Nothing can be done I was told, I would have to come to Toranomon. So I calmly told the clerk that if such was the case, then I would be unable to pay the balance. 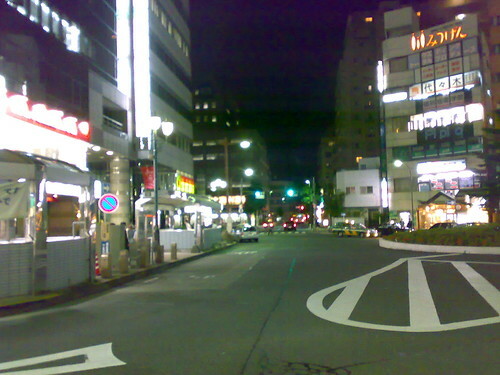 Fifteen minutes later the phone rang and all of the sudden, it was possible for me to pay the balance in Hachioji. During my lunch break I showed up at the Hachioji branch, stated the bank clerk’s name in Toranomon and they called her to confirm that this transaction could be allowed. 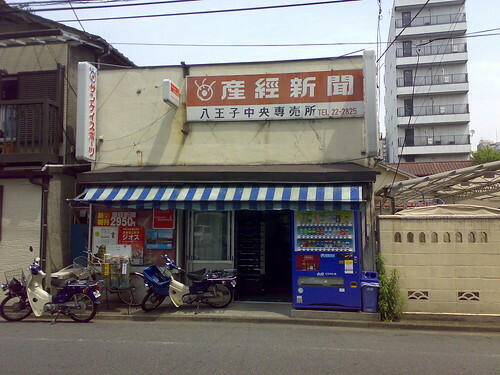 After all, it was a former UFJ branch! I payed cash, and they were ready to send me on my way. Before leaving, I asked for a receipt to have as proof of handing them the cash, and their jaws dropped. Heresy! I realize I made it hard on the clerks, but they sure did their best to make it hard on me too. It is the 21st century for crying out loud, would be nice if the bank didn’t still operate like it is 1959. After getting advice from a close friend, I decided to open a savings account at Citibank, which I thought might offer more progressive financial services. After all, until recently it was the largest bank in the world. Citibank requires an average daily balance of 500,000 yen, and in return you can deposit foreign currency in foreign currency accounts and your bank card is on the Plus financial network which allows you to use it overseas in most countries. They also have US Dollar bank cards that allow you to withdraw US dollars from a US dollar currency account in Japan. As I traveled in Canada I really enjoyed being able to withdraw cash on the Plus network bank card as needed at local Canadian bank ATMs rather than having to carry a stack of cash around. The bad news with Citibank is that their online and telephone banking services are more primitive than most regional banks in Japan. The local bank had a much wider variety of services on their Internet banking website. I wanted to transfer some yen from my Citibank account to my local bank account, but I had to go to the Citibank office in Ikebukuro and register the account there before I could transfer via telephone and the Internet. The lack of access to my funds in Japan meant that I needed to find a new bank. It is my opinion that Citibank is good for Japanese nationals who are either studying or working abroad. These services are clearly not ideal for regular banking in Japan, and with the 500,000 balance requirement they’re essentially making money off of you while not having to pay any interest on yen–well, 0.004% interest, is basically 0%, right? A Swedish man on the Tokyo metro once told me about a bank where he was teaching ESL, Shinsei bank. Eventually I gave them a try and Shinsei bank has really been the best bank so far. Unlike Citibank, there is no monthly average deposit requirement, and Shinsei offers foreign currency deposit accounts as well as bank cards on the Plus network. Up to five bank transfers per month have the processing fee (300 yen usually) reimbursed, and using partner ATMs you can access your money at any time and the processing fee is reimbursed. From 7-11 you can access your money on their iBank ATM networks 24/7 with no processing fees either. One other bonus is that the bank card is also on the J-Debit network, so at large institutions like hospitals it is often possible to pay with debit rather than having to lug around cash. The lack of ATMs can be considered a downside though, and you have to be careful when you travel. Some ATMs , such as SMBC or Tokyo Mitsubishi UFJ ATMs, often refused to process my transactions on weekends. Shinsei was also a problem when I traveled to Nagano and the Japan Sea. My bank card was not accepted by the regional banks in that area and I ended up having to use a cash advance on my credit card instead. 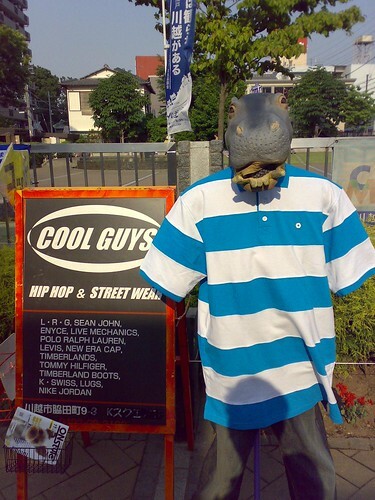 They do charge 4000 yen per transfer, and Citibank US, who does their processing stateside, also takes US$15 in fees. I’m sure it is the same for other currencies too, as they generally use Citibank for all overseas transactions. My bank in the US accepts yen transfers for free, but I still would have to pay the same transaction fees. However, the paperwork is simple, and after you register an account once, you can then make transfers via telephone. I just recently discovered Lloyds TSB PLC in Tokyo. They are not so much a bank, rather they are a currency export service provider. I have not used their services, but for anyone needing to send money back home in small sums, this service seems quite convenient. You register your foreign account, and then transfer yen to Lloyds and they take care of the currency conversion. They do charge a 2000 yen service fee, and they also take a 0.1% fee on the original yen transfer. If you’re transferring a student loan payment though, which hurts more? The 0.1% of the yen amount, or taking time off of work and losing holiday time? For me, missing work was much more dear…and NOT because I like going to work. 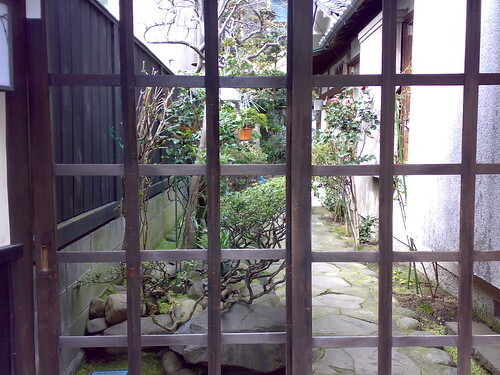 Time is severely limited, so I didn’t walk around the historic part of Kawagoe that I love to visit. That is fine though, I took tons of pictures for memories back when I last tried to escape to America. 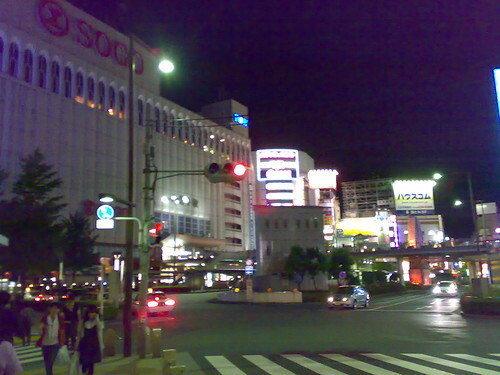 This time I just walked around the shopping areas surrounding JR, Tobu and Seibu Kawagoe stations. This is actually at a Sigafredo coffee shop in Kita-Asaka, but I stopped in on the way to Kawagoe because I needed to kill an hour before meeting up with former colleagues. 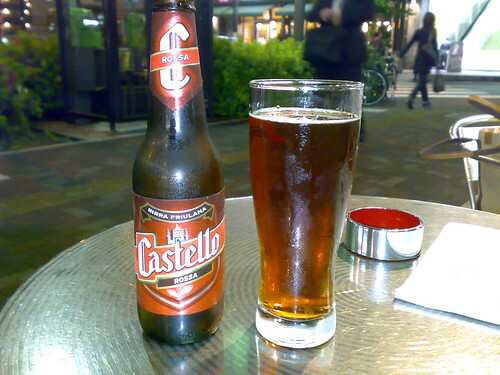 This Castello Rossa is a very fruity beer that is quite pleasant in the warm late-spring evenings — and yes, I like to pour my beer with as few bubbles as possible. 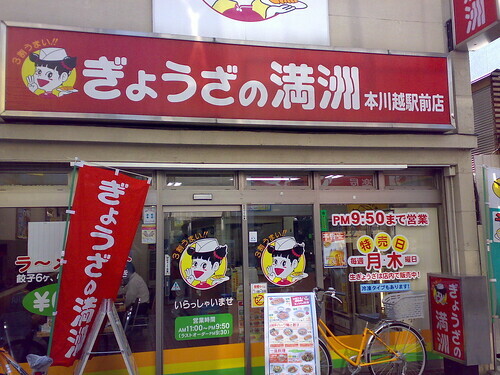 This pot-sticker, or gyoza, chain is all over the Tobu Tojo line in Saitama. 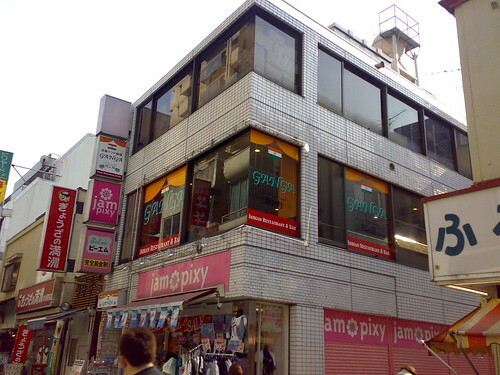 When I first moved to Japan I lived in Asaka city and this chain restaurant was on my way home. When I did not feel like cooking I would stop by and get a plate of pot-stickers and a bowl of rice for dinner. I really like this chain, and it is kind of a special treat for anyone commuting along the Tobu Tojo line. 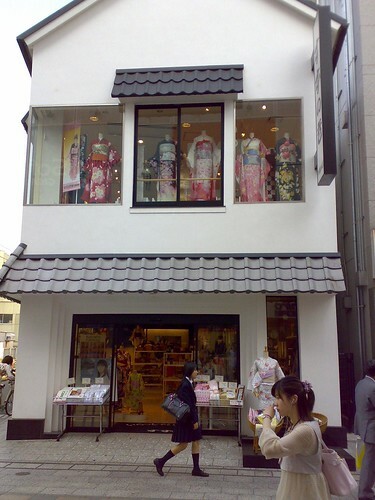 A traditional Kimono shop in Kawagoe – I’ve seen lots of shops come and go in Kawagoe over the past five years, but this one seems to be doing steady business. This is a great little restaurant tucked away in the suburbs. Besides serving fusion-style lunch and dinners, from 2 PM to 5 PM they have tea time where you can enjoy imported Taiwanese tea like you would in a Taiwanese tea house! I once talked with the manager and she spends time in Taiwan every year trying to find new teas. Taiwanese tea is world class and I hope one day more shops like this will open all over the world. If you’re looking for a quiet place to chat with a friend or just spend some time alone, definitely go to Simple Simon. The atmosphere is great for winding down with the dim lighting and and relaxing jazz music (not the noisy, wailing saxophone type). 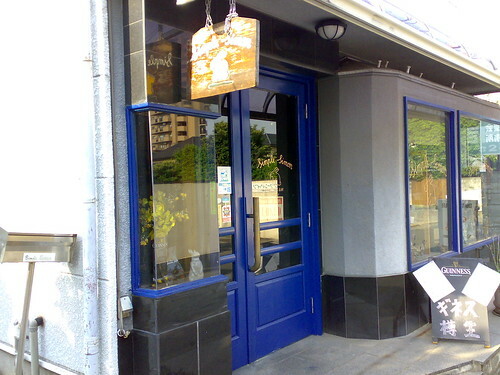 Simple Simon has a light dining menu and a good selection of import beers, cocktails and wines. The real treat is the extensive whiskey list with many different types of scotch from the UK. The owner, Mr. Shimano, is a quiet man but very welcoming and open to chatting. I really enjoyed visiting his shop and talking with him over the years. 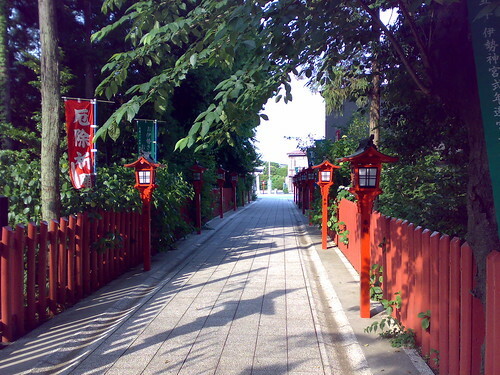 This path leads to a temple, one of the many temples all over Kawagoe. It is a great city for those interested in Buddhist temples. 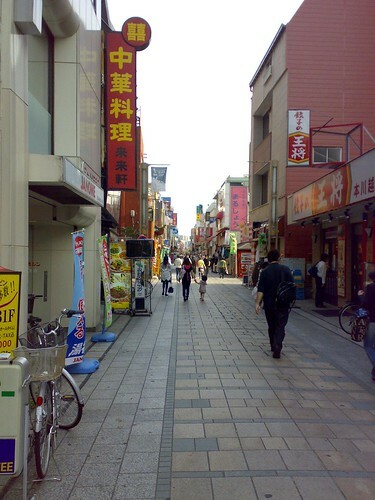 This one part of Kawagoe always felt like Tokyo to me. There was a time when I wanted to lived in Tokyo, but looking back I really appreciate Kawagoe and I’m happy I had the chance to live and experience in this slowly but surely growing city. I had many challenges and difficulties in this city when I first arrived, but I wandered all over the city on foot finding something interesting and making the best of my time. 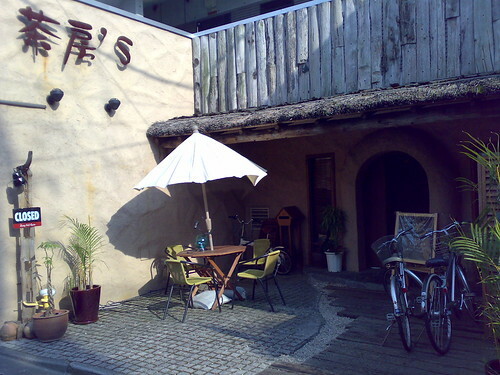 I also met my wife here (it is her hometown), and my son was born in a hospital in Kawagoe too. Kawagoe will always be a special place for me. 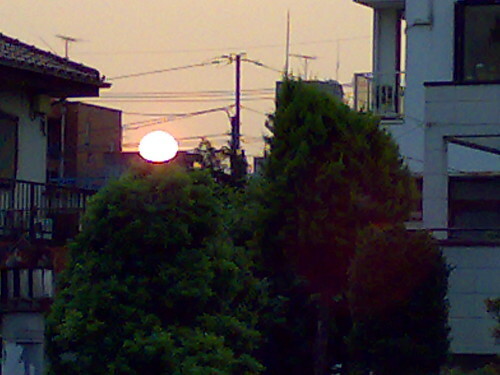 Good-bye, Kawagoe, I will miss you. 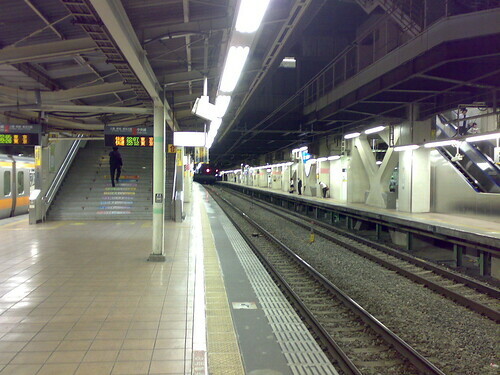 Last Friday was my final day of work, and as such, my final day in Hachioji. It is fitting that the weather in that final week was hot and humid. I’ll always remember Hachioji for the most intense humidity I’ve experience in all of my travels in Japan. 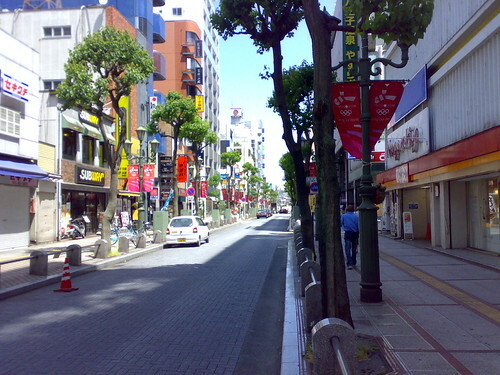 On the day before my last day at work I snapped some pictures of Hachioji for memories. They are not in any particular order, I just snapped them before and after work. 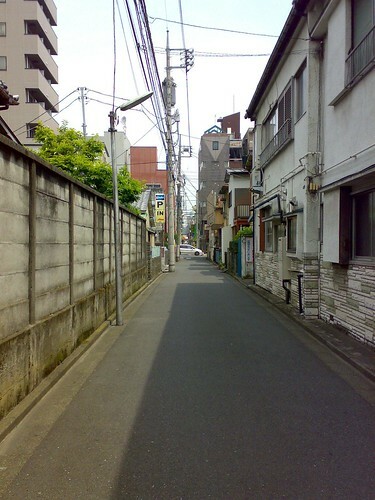 Join me for a final walk around Hachioji. Around the station the city is sleepy and doesn’t awake until noon – oh, and Subway does NOT have southwestern sauce…you cannot imagine my disappointment at this discovery. I lived off of subway sandwiches with southwestern sauce during year-four of engineering school. 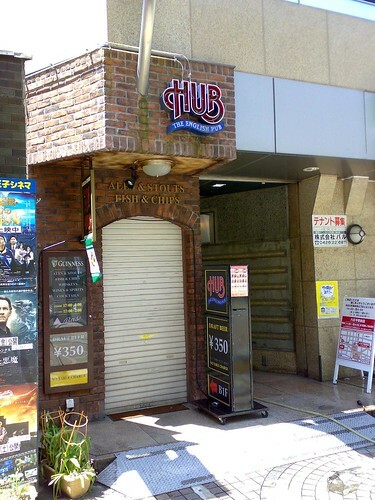 The local “Hub” – a British-style pub chain that one can find all over Tokyo. 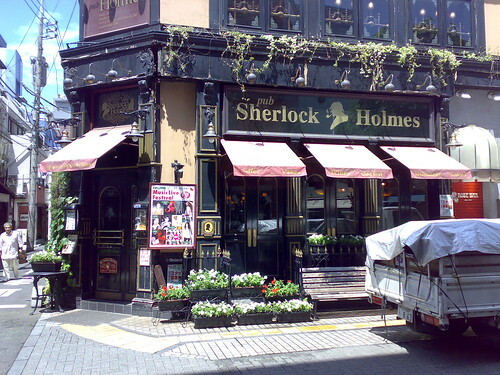 I and my British mate probably spent too much money in this pub over the past two years. Hub has their own ale too which is rather good, especially the winter season ale. They also have fish and chips with real malt vinegar! This particular Hub is nice because they have big screen TVs and show English Premier League as well as J-League football matches. The owner is crazy about the Tokyo Verdy football club and has all sorts of uniforms and sports fans memorabilia strung up all over the place. Small streets everywhere – as the city ages the houses are torn down, and in their place yet another coin parking lot pops up. Shame. Another British style pub, but unlike Hub this one has a table charge like most Japanese watering holes. I thought I’d come here more often but I only came one time with my wife when we first found out we would be moving to Hachioji. The atmosphere is really nice, though a British national would probably not think so. It is probably only interesting for people like myself who have yet to travel to the UK. The ownership is a local holding company also has an Irish pub, two American western-style saloon/whisky bars, and some other watering holes too. My nokia phone doesn’t do too well at night, but you get the idea. 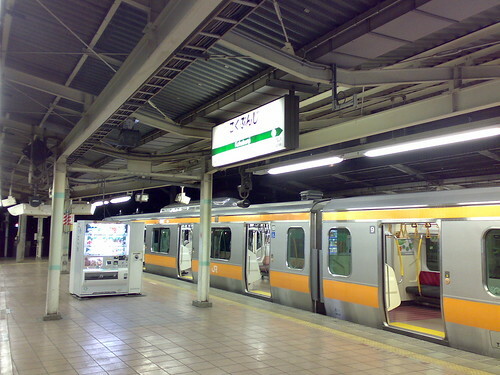 JR Hachioji station – Go through the the Sogo department store and then you can board the train. Otherwise there are plenty of buses running during normal hours and an army of taxis always waiting to server. It always makes me laugh to see the grandmothers waiting outside the Sogo doors at 9:55 AM for the store to open in the mornings. 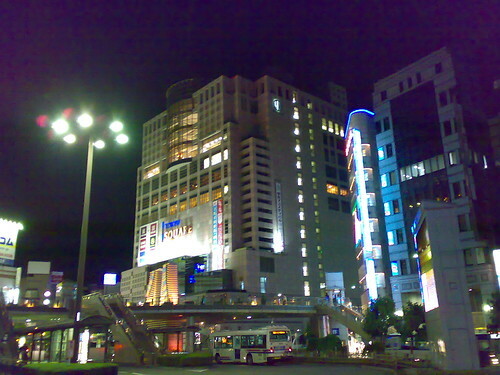 Across from Sogo is Tokyu Square, a Singapore-style tower shopping mall. 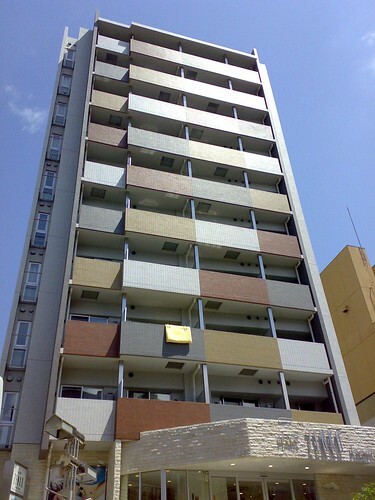 It is also home to the International center. The ticket gate is always busy with people transferring trains. 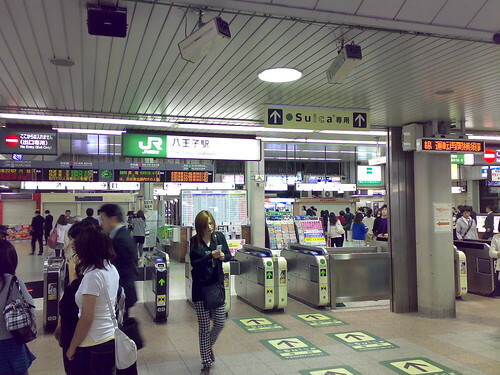 Hachioji is the intersection point for the Yokohama line, the Chuo line, and the Hachiko line. 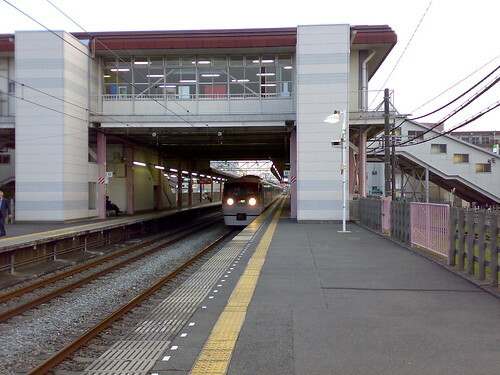 Hachioji also links Yamanashi and Nagano prefectures to Tokyo and there is an express train that runs all the way to Matsumoto. I recommend that you drive to Nagano instead. 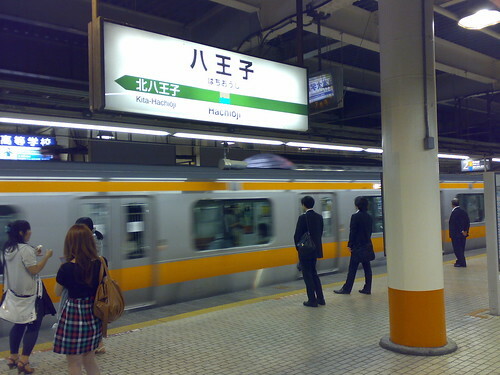 The orange denotes the infamous Chuo line, infamous for delays, stoppages, and general tardiness. 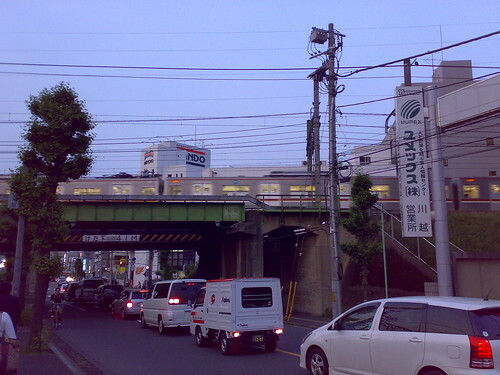 Besides thepart of the Musashino line that runs on raised rails in Saitama and Chiba and is constantly stopped due to wind, I know of no other train in Tokyo that is constantly late like the Chuo line. Good-bye Hachioji, it was interesting. If you follow the Japanese media, you would think it is the end of the world, yet Canadian and US media rarely mention the swine flu any more–quite puzzling. The other day I heard through he grapevine that the Ministry of Health warned that WHO level might reach level 6, which means no leaving or entering Japan. I cannot believe they let some wanker get on TV and say that! It would completely tank the Japanese economy even more than it already is, and I suspect that the WHO is not going to risk the fragile global economy for a flu virus that is not near as deadly as was once suspected. I cannot really understand the fear, and I am getting suspicious it is being manufactured by the media. The Ministry of health claims that because of the large population of seniors, they are concerned about any flu outbreak in dense urban areas. However, as reported by the BBC, the swine flu seems to be affecting younger people and not the seniors. I’ve been in Japan for five years now and I lived through both the SARS outbreak and the Avian flu virus. During those outbreaks no one really seemed to care about the viruses. It was a “Chinese” problem apparently, and whenever avian flu was found they just culled the poultry farms. For some reason though, this swine is to be feared at all costs!